Naturmobil: Car runs on realy ‘horse power’ ! 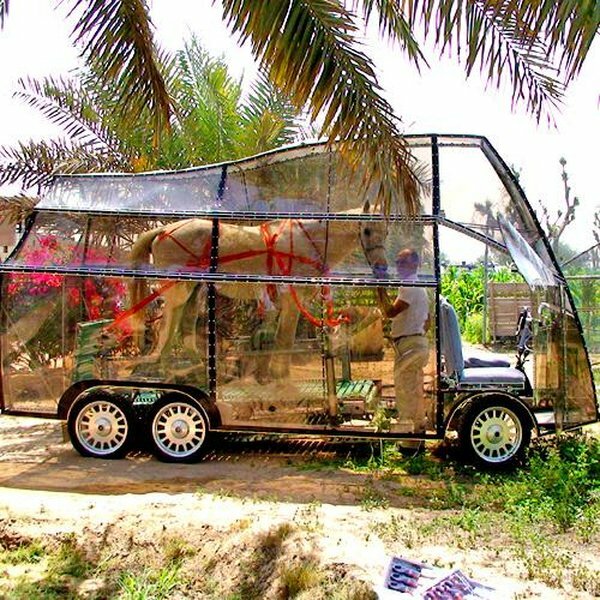 Abdolhadi Mirhejazi’s friends thought he was off his rocker when he told them his idea for Naturmobil – but it has not been around bucking. His plan was to create a vehicle really putting the cart before the horse. And once it had received the bit between its teeth, wild stallions could not tear him away from his hobby. The result of his work is a one horsepower, the space age in all weathers powered by buggy, ugh, a horse. Unlike horse-drawn vehicles, the horse inside, behind the driver, protected by an overcast day. 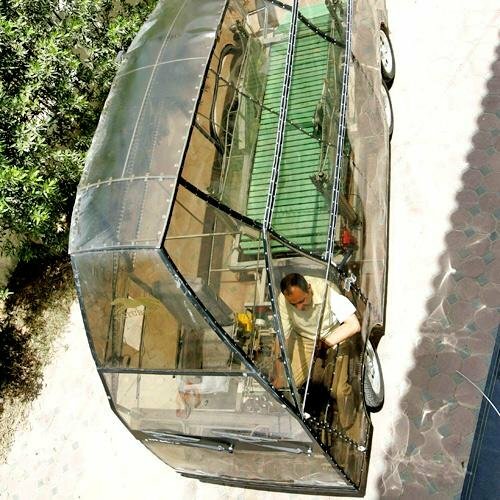 And thanks to a polycarbonate light and complex leverage, it can reach speeds of up to 80 km / h – although its cruising speed is a more calm 20km / h.
“My friends and relatives thought of myself as somewhat eccentric inventor half crazy trying the impossible,” said Mirhejazi, an Iranian engineer, has his invention to Dubai. However, a friend was willing to rustle up enough money to the project in the starting blocks orders. 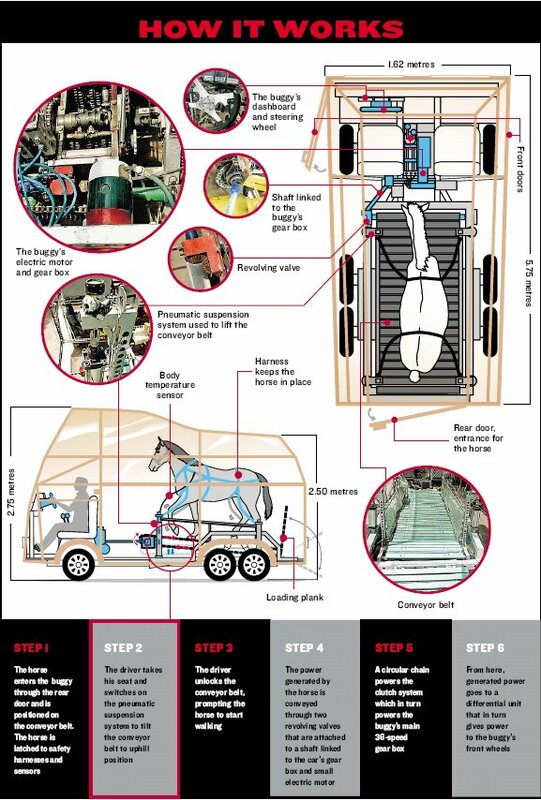 The horse walks on a treadmill fiberglass, generate enough power to the 300 kg of natural mobile motorcycle along on six wheels. 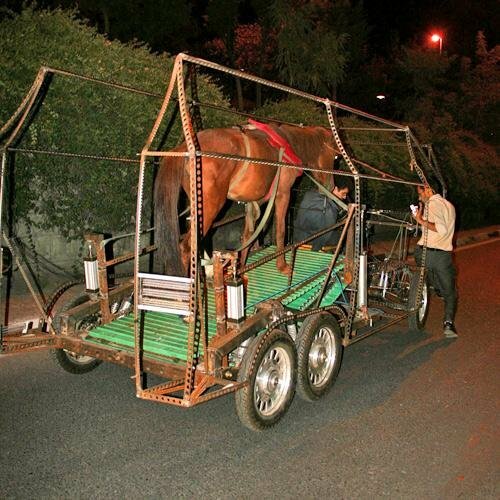 Mirhejazi says it produces enough excess energy to charge a small battery, which powers the buggy’s light, the electrical system, and can even take over from when the horse Neddy needs a break. If the horse the body temperature is too hot for comfort, a sensor on its side sends its temperature to a reading of the controller automatically switches off the treadmill and turns the vehicle to battery power. Neddy can then for the remaining 20 minutes before the back-up power running. 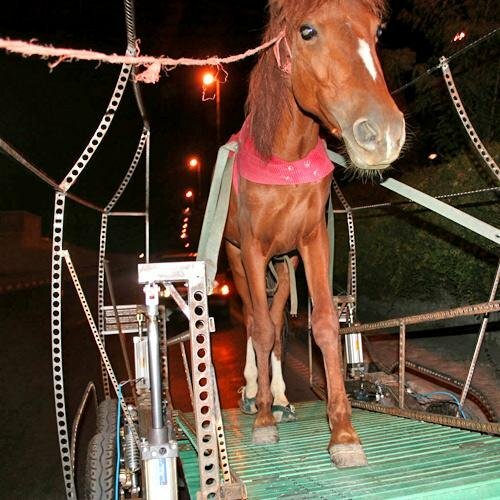 Mirhejazi, runs a company specializing in agricultural machinery, said he came up with the idea to brood on how to use horses in new, cruelty-free manner. “I tested the first vehicle in January 2006. It was about 2 and the deserted streets of Tehran in Iran were ideal for the experiment,” he said. Mirhejazi already has the mobile nature exhibition in Geneva, and plans to take it to the next Invention and New Product Exhibition in the city of Pittsburg in California, USA, this June. “After the show, I have the intention to create a live demonstration there with a locally procured horse and hope that some sponsors,” he said. He needs sponsors to finance the creation of a second-generation mobile nature – a four-horse carriage to carry tourists. And he hopes that the bizarre nature of the existing design is mobile enough attention to finance the next version. “Given the originality and uniqueness of the idea of mobile nature was designed and built to the maximum degree of attention from his audience,” said its marketing manager, F. Minooeifar. Mirhejazi says the mobile nature was developed with the safety and welfare of the animals in mind. No whipped cream is involved. To move the horse, the driver flicks a switch to the conveyor belt, where the horse is moving. The belt is repealed simulate a tough state to prevent recovery of harming the horse. The gear is designed to facilitate the pressure on the horse. The horse must not exercise its full power to achieve a faster speed. Shock absorbers are under the conveyor belt to reduce the impact on the horse of the joints. A digital display unit allows the driver to monitor the horse. Two sets of sensors are connected to the horse to monitor their heart rate and body temperature. A pergola attached to the top of the vehicle is designed to protect the horse from cold and heat and can be opened if the horse needs air. The horse will wear special soft-leather shoes, tied with lace to walk as pleasant as possible. Trash is also available to collect the horse-discharges. Another bag is for food.